This web page presents information gathered and analyzed by SRPEDD in support of the ongoing Seekonk Economic Development Plan project. Please note that this page is draft and therefore still under construction in June 2018. Final versions of this information, input from business owners, town officials, and the public, and past planning efforts will inform the final document. You may use your mouse hover over, click on, download, and otherwise interact with much of this data. Please contact Grant King, AICP with any questions, proposed edits, or comments. Data sources include the U.S. Census Bureau, the U.S. Department of Housing and Urban Development (HUD), the Massachusetts Executive Office of Labor and Workforce Development (EOLWD), the Massachusetts Division of Local Services (DLS), ESRI, the Warren Group, the Town of Seekonk, and SRPEDD. Seekonk is growing. Its population has increased faster than that of Metro Providence (which includes all of RI and Bristol County, MA). 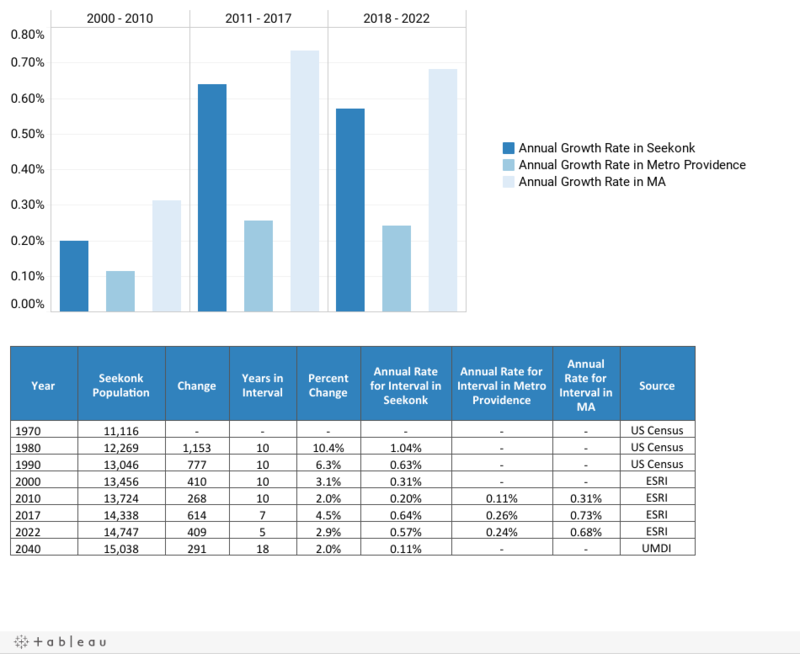 Seekonk is growing at a slightly slower rate that MA, as a whole. Please see the chart and supporting table, below. Discussion Question: How has population growth affected the Town's ability to provide services and maintain modern facilities? Relative to the Metro Providence region and to MA, as a whole, Seekonk has an older population. Much like the rest of the state and nation, Seekonk's population is aging - its median age has increased by over ten years since 1990. Discussion Question: Has the "needed service" profile changed along with the Town's aging population? In 2017, Seekonk's average HH size was 2.71; this was larger than that of MA, at 2.50, and Metro Providence, at 2.47. Over the next 5 years, the town, Metro Providence, and MA are all projected to maintain approximately the same average HH size. Relative to the Metro Providence region and to the Commonwealth, Seekonk is an affluent community; however, its incomes are projected to grow at slightly slower rates than in the region and state. Discussion Question: Does Seekonk see itself as a "bedroom community" of professionals working in Providence? (Note: According to the 2016 American Community Survey, 51.2% of workers [16 years-old and older] work outside of MA, presumable in Providence and RI, and only approximately 21.4% work in Seekonk, itself.) If so, how does this image inform its local policies? 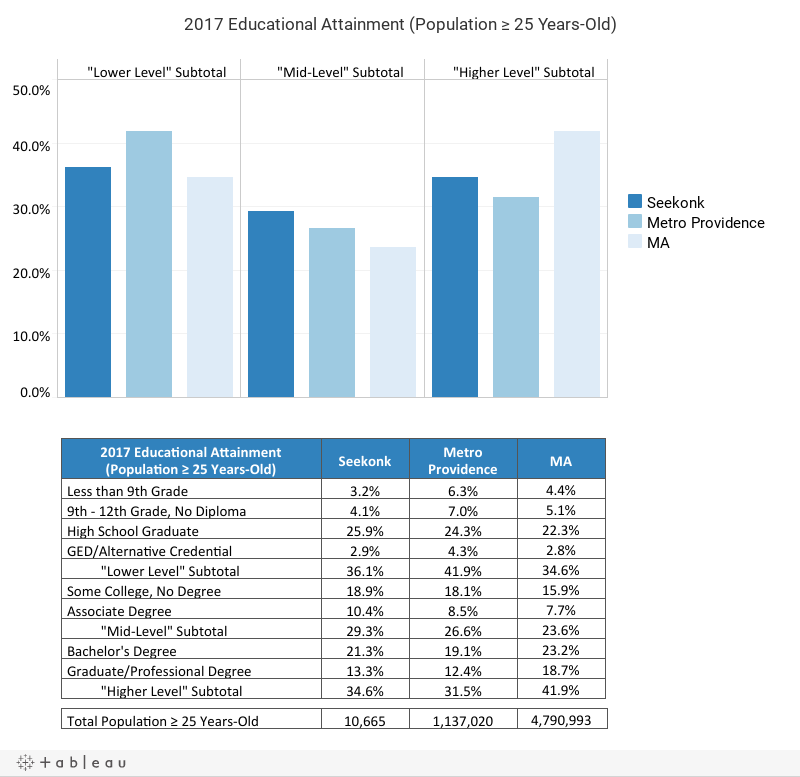 Seekonk has a higher share of residents with "Higher Levels" of education than Metro Providence, but a lower share than the state. 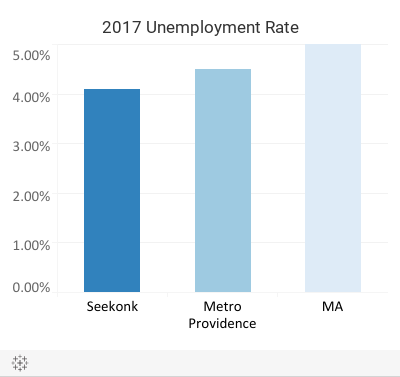 Seekonk has a lower Unemployment Rate than both Metro Providence and MA. Please see the chart and supporting table, below. The split between Seekonk's Residential millage rate and Commercial millage rate is large compared to nearby communities and the SRPEDD Region. Discussion Question: How are tax rates and tax policy perceived by Seekonk's residents and businesses? Thanks to its relatively high split commercial rate, Seekonk has a fairly diversified tax base compared to nearby comminutes. Discussion Question: What's your take on the Town's recent history of fiscal health and policy? 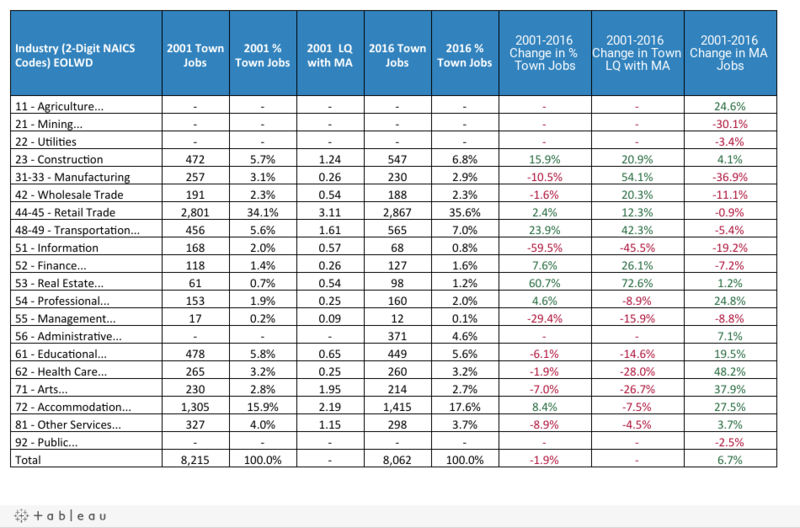 Location Quotient (LQ) Analysis is a way to understand how Seekonk's employment patterns compare to those of a larger region - in this case both Metro Providence (first table) and the state of MA (second table). LQ is basically a ratio, where, if an industry's LQ is greater than one (>1), Seekonk has a higher share of jobs in that industry than its surrounding region. 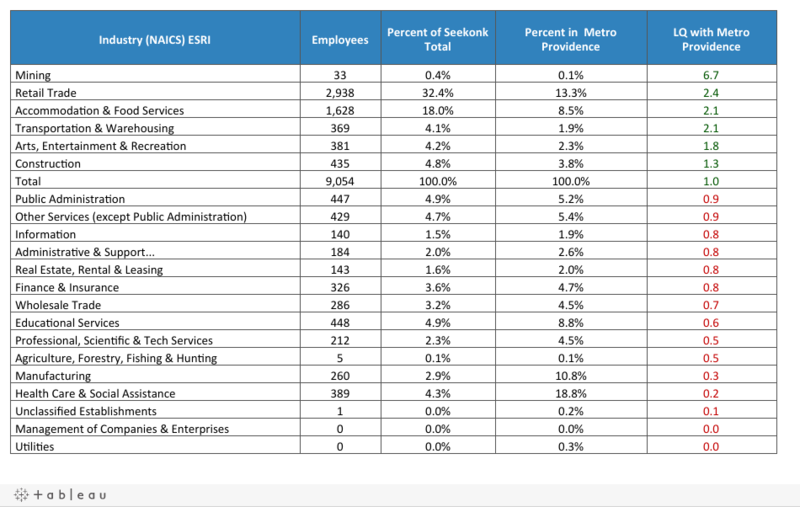 For example, in the table from 2017, below, Seekonk's LQ with Metro Providence in "Retail Trade" is 2.4 (or 32.4% divided by 13.3%). This indicates that Retail as an industry is roughly two-and-a-half times more concentrated in Seekonk than it is in the surrounding region. This finding, along with Accomodation and Food Services at an LQ of 2.1, corresponds with the predominance of retail and dining establishments the town's list of the town's top employers from the MA Executive Office of Labor and Workforce Development (EOLWD). LQ can provide even more insight into a local economy when combined with trends. For more on this, please the second LQ table, below. Discussion Question: What does Seekonk's high share of Retail Trade and Accomodation and Food Services tell us about the Town's economic base? What policy tools are available to minimize fluctuations in these sectors? Industries with high LQs are typically "export" industries, meaning that they bring economic activity into town (instead of simply circulating money and resources that are already in town, as is typically the case with Retail and Service industries, except where otherwise indicated in Retail Market Analysis [see below]). From this perspective, the town's most important industries are those with both high LQs, indicating they are highly concentrated, and those with a high share of the town's overall employment. Policy makers should monitor trends in both overall employment and LQ in these industries. For example, in Seekonk from 2001 - 2016, the Construction, Retail Trade, Transportation and Warehousing, and Accommodation and Food Services industries were all fairly sizable (in terms of their share of total employment in Seekonk), relatively concentrated (LQs >1), and growing (in terms of both their share of overall employment in town and in LQ [with the exception of Accommodation and Food Services, which grew, but did so at much slower rate than in MA, resulting in a reduction of its LQ over the period]). Industries with negative trends from 2001 to 2016 include Other Services (which is relatively concentrated, but lost both overall share and LQ) and Education Services (which, while not relatively concentrated, has a fairly high share of overall employment and experienced job losses while MA experienced growth). 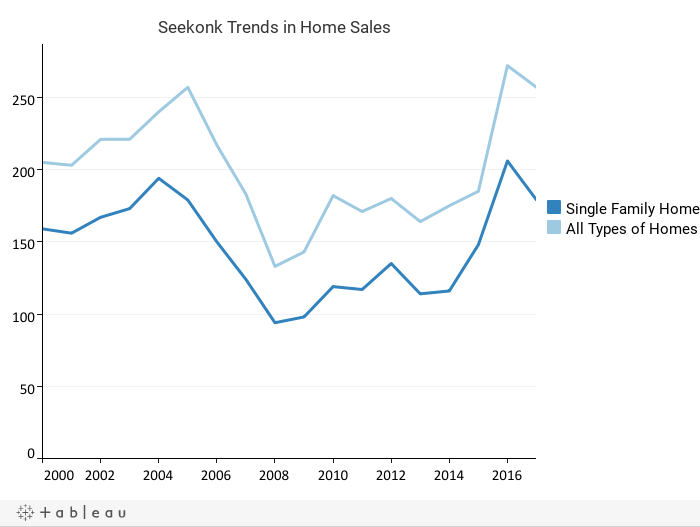 This analysis allows a "deeper dive" into Seekonk's important retail industry by identifying detailed types of establishments and examining how they preform relative to typical market expectations. Retail "Demand," estimated in current dollars, is the amount expected to be spent by consumers in 2017 at establishments in Seekonk. "Supply" estimates actual retail sales to consumers (excluding businesses) by establishments in Seekonk. The Retail Gap is a measure of the relationship between Seekonk's "Supply" and "Demand," where a negative number (in red) indicates a surplus of retail sales - in other words, where customers come to shop in Seekonk from outside of town. Positive numbers (in green) indicate "leakage" of retail opportunity - in other words, where Seekonk residents would leave town to shop or dine. Seekonk's retail strength is clearly visible here, where expected demand is exceeded by actual supply (retail sales) in almost every category. All of this analysis can be boiled down to a "Leakage Factor," where 100 is total loss of retail opportunity and negative 100, or (100) is "total surplus." Measures of housing affordability and trends in home prices can provide insight into a community's attractiveness and competitiveness relative to its region and neighbors. Seekonk's home prices have typically been lower than MA and the SRPEDD region and higher than Bristol County. 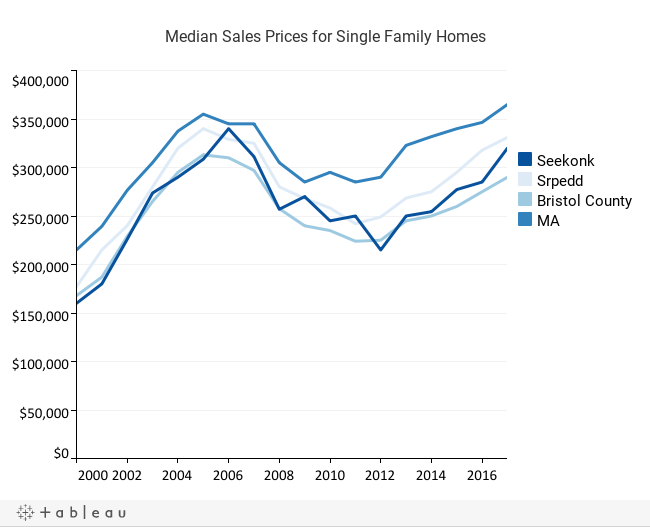 Like much of MA and the nation, Seekonk's housing market declined during the "Great Recession;" however, housing sales have increased in recent years to exceed pre-recession levels. 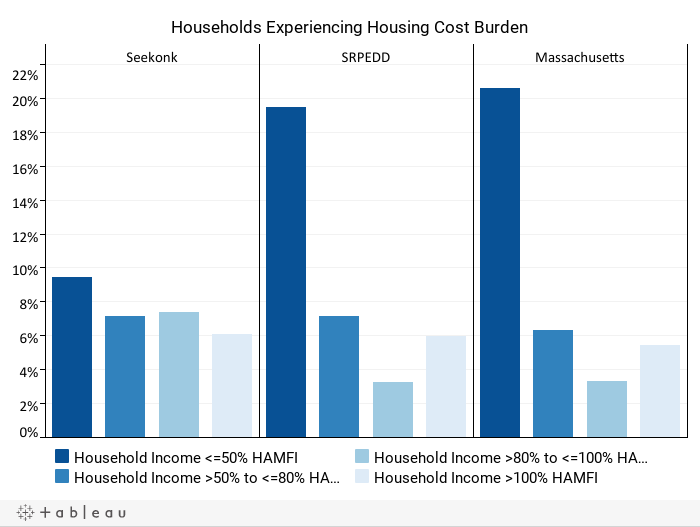 Households that spend >30% of their income on housing are considered to have "Housing Cost Burden." In seekonk, this burden is relatively low. This DRAFT interactive map includes the Town's Priority Development Areas (PDAs) and Priority Protection Areas (PPAs) as designated in 2013. You may access other layers (Zoning and Land Use) by clickin on the >> arrows and turning layers off and on. Discussion Questions: Do these PDAs and PPAs remain priorities for Seekonk? If so, for what purposes? If no, what has changed? Does the town have updated parcel and Asessor's GIS data, zoning GIS data, and utility GIS data (particularly water and sewer) that you can share with SRPEDD?